Mixed forest with multiple tree species is expected to create heterogeneous habitat and diverse niches for the canopy arthropod community. 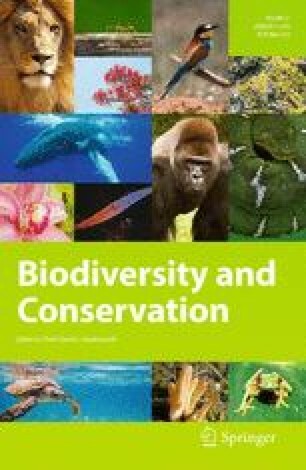 We assessed arthropod abundance, order richness, and community composition in the crowns of saplings of nine temperate tree species in two plantations of a recently established tree diversity experiment in Belgium, and looked for relationships with the diversity and structure of the sapling’s local neighbourhood. The crown arthropod community differed between the two study sites, both in terms of abundances and composition. More arthropods were found in the post-agricultural site; the arthropod community was more complex in the formerly forested site. The tree species identity of a sapling, its apparency, and the phylogenetic diversity of its local neighbourhood all affected the crown arthropod community. Our study suggests that mixing phylogenetically distant tree species creates niches for a complex crown arthropod community. Communicated by Nigel E Stork. The online version of this article (doi: 10.1007/s10531-015-1044-z) contains supplementary material, which is available to authorized users. The authors thank Luc Willems for the help on assembling the aspirator. The helpful comments from the editor Nigel Stork and the two anonymous reviewers are greatly acknowledged. The paper was written while NNS was funded by LOTUS Erasmus Mundus Action 2, MV and LB were funded as Postdoctoral Fellows of FWO-Vlaanderen, PDS and WP were funded as Doctoral Fellows of FWO-Vlaanderen. The paper was written while NNS was funded by LOTUS Erasmus Mundus Action 2, MV and LB were funded as Postdoctoral Fellows of FWO-Vlaanderen, PDS and WP were funded as Doctoral Fellows of FWO-Vlaanderen.